2011 Oddero, Barbaresco DOCG “Gallina” Piedmonte, Italy. It was great meeting the youngest of the Oddero’s Pietro and taste the latest releases from this great Piedmonte winery, in a few short years Odder has moved into my top 5 Piedmonte wines, joining Giorgio Rivetti’s La Spinetta, Chiara Boschis, G.D. Vajra and Brovio as my favorites, I especially love their Barbera and Barolo wines, but just I discovered and fell in love with the Oddero 2011 Barbaresco Gallina! If you were going to compare Piedmonte to Burgundy, just by using Nebbiolo as your grape, then Barbaresco maybe would be Morey-St.-Denis or Chambolle-Musigny, and the Gallina Cru to me would be likened to either Clos Saint-Denis or Clos de la Roche, such is the lovely perfumed nature and Grand Cru class this vineyard elicits on your senses! All of the Oddero Nebbiolo wines are silken and wonderfully elegant, in fact they are amazingly so and each shows distinct pure terroir character, less about the winemaking, which is exceptional, and more about the place and time, these wines are transparent and deliver a clarity of purpose with grace and stylistic charm, in particular this gorgeous Gallina. 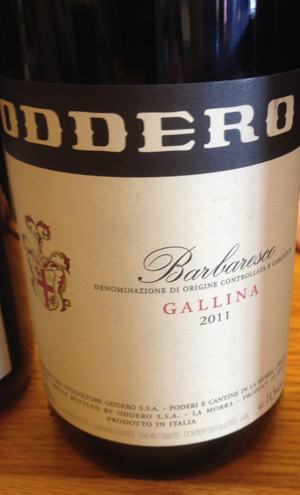 The 2011 Gallina Cru Barbaresco from Oddero, a warm and near perfect Barbaresco vintage with joyous textures, aromas and wondrous inner complexity is delightfully easy to dive into with reckless abandon, it pleases completely with glorious fruit, mineral tones and well defined structures. The Gallina is full of flavor with a a light ruby/brickish hue in the glass and a lifting nose of dried roses, fennel, cinnamon stick and mixed berries leading to a round and full palate of black cherry, spiced plum, raspberry, tangy dried currants with basil and balsamic covered strawberries along with chalky stones, tar, melted black licorice plus sweet and savory spices, garden herbs and crushed violets, finishes with a hint of cedar, blueberry tart and kirsch. This is a total beauty, lengthy, vibrant and expressively seductive, this is tasty stuff and a knockout in this price class, drink over the next decade, best from 2017 to 2022.